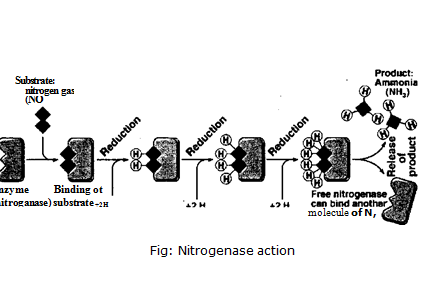 The enzyme nitrogenase controls this reaction. This enzyme contains two metallic components molybdenum and iron. This reaction is not so simple. Several intermediate compounds are formed. But such compounds are not stable. Therefore, they are not clearly identified. Diamide (NH = NH) and hydrazine (N112—N142) and NH3 — NH3 are the intermediate compounds. They are formed during formation of ammonia. Hydrogen for the reaction is donated by NADH,. Respiration provides energy.